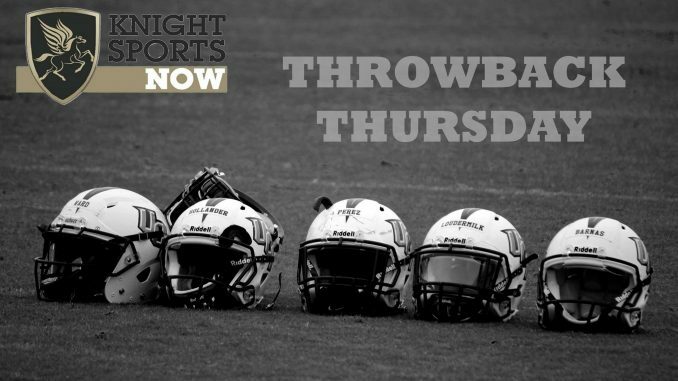 Each Thursday until the 2018 UCF Football season gets underway, Knight Sports Now will have a little fun with Throwback Thursdays. Every week, we’ll take a look at the Knights’ best game in each of their years competing at the FBS level. This week, we continue with 2000. Throughout all of the current back and forth between UCF and Alabama about claiming national championships, one fact remains: the Knights are undefeated all-time against the Crimson Tide. The lone meeting between the two came back in 2000, with UCF picking up a 40-38 win at Bryant-Denny Stadium, spoiling Alabama’s homecoming in the process. The victory came in the game’s final seconds, with Javier Beorlegui nailing a 37-yard field goal to give the Knights their biggest win to date. UCF got a strong day from quarterback Ryan Schneider, as he completed 27 of his 48 passes for 283 yards and three touchdowns. His top target was Tyson Hinshaw, who hauled in eight catches for 102 yards and two touchdowns. The UCF defense, despite giving up 38 points, also had a nice day. The unit picked off Alabama quarterback Andrew Zow four times. Davin Bush returned one of those interceptions 47 yards for a touchdown. The star of the day, though, was Beorlegui. Even before his game-winner with three seconds left, he had connected on three other field goals. He helped UCF build a few leads throughout the day. The Knights went up 10-0 early, then fell behind 24-10. They got back on top after 27 unanswered points, but Alabama overcame a 31-24 deficit in the third quarter. The Tide took a 38-37 lead with 2:24 left in the game, but Schneider went seven-for-eight on the ensuing drive to set up the 37-yarder from Beorlegui. UCF went on to finish the season with a 7-4 record, while Alabama stumbled to a 3-8 record. Even still, the Crimson Tide had won the SEC Championship a year earlier and the Knights were still finding their footing as a new member of the FBS. The victory in Tuscaloosa is still talked about to this day, which is just part of the reason why it comes in as our pick for UCF’s best game of the 2000 season.